WOW!!!! When I first saw this photo I was in awe! What a strikingly bold and beautiful colour to include in your wedding theme! 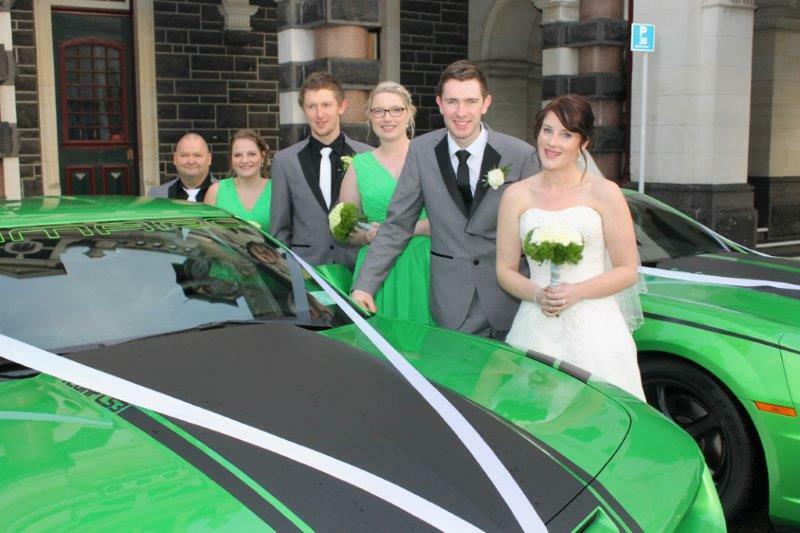 Not only that but how on earth did they manage to do such an amazing job colour-matching the dresses with the cars!!! This really had me ‘green’ with envy – when I was picking props for my Tiffany Blue wedding theme – it was a crazy nightmare trying to get just the right shade of blue!! And forget trying to find a Tiffany Blue bridal car!! The beautiful Bride looks even more gorgeous – her elegant white gown just pops surrounded by the vibrant green. Plus the handsome Groom and groomsmens suits perfectly balance this colour scheme. Other bold and bright colour combo’s you could consider for your wedding are orange – one couple I recently married had bridesmaids dressed in long flowing bright, bright orange gowns with silver sequin bodices and the most stunning Bird of Paradise orange tropical flowers to complement. Another bride and groom chose to integrate purple into their theme with the boys wearing purple ties and pretty purple floral arrangements. Even if it’s not the main feature colour, it’s unique to have striking accents or to mix and match more traditional colours with a blast of brightness (we used Tiffany Blue, White and Sunshine Yellow). You could even have a variety of different bright candy colours to really make a statement! Thank you so much Mr & Mrs Lobb for sharing your incredible photos with us! They are beautiful!